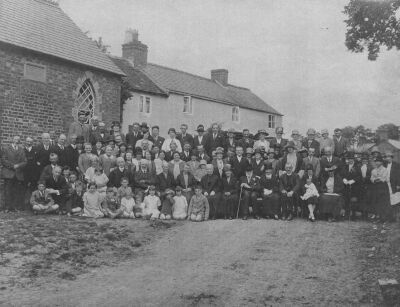 This photograph was taken on the occasion of a 50th wedding anniversary, outside the Primitive Methodist Chapel (left) in Stanwardine in the early 1920s. It clearly shows where the original door into the chapel used to be, under the commemorative plaque. The door is now in a porch added onto the building to the left of this picture. To return to the modern photograph click here. Grid ref: SJ 411245.